Saturday, December 16th, 9:00 a.m.
All are invited to join in as we pack and hand out the baskets. There are many ways to contribute to our Christmas Basket families! * Sponsor a family with food. * Sponsor the children's gifts. 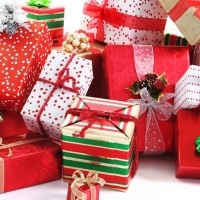 Shop and have the gifts wrapped and to the church by Wednesday, December 13th. * Sponsor a family together with friends or fellow worshipers for food. * Be an Angel Shopper for the food and gifts, helping others who aren't able to get out and shop.